Courtesy of Washington CEO Magazine. 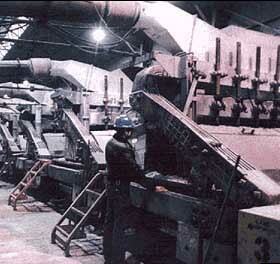 Alumina is electrolytically reduced into molted aluminum. This reaction occurs in Hall-Heroult reduction cells (called pots) where the bound oxygen in the alumina reacts with carbon electrodes to form carbon-dioxide gas and aluminum. Each ton of aluminum requires 0.4-.05 tons of carbon anodes.